The British Motor Corporation officially announce today the entirely new small cars that – unofficially – have been described, illustrated and discussed for many months past. Although there are two cars, called the Austin Seven and the Morris Mini-Minor respectively, they are in fact identical except for the radiator grille and, during their development, they have been known by the single code name of Project ADO 15. It can be asserted that these B.M.C. cars set an entirely new standard in low-priced motoring because they make no sacrifices in the way of performance and comfort. The B.M.C. engineers tested experimental twin-cylinder air-cooled engines but they decided that they were not satisfactory in terms of economy, noise level, smoothness and life. They have therefore used the four-cylinder A-series engine of the Minor 1000 and A35 with a shortened stroke, giving it a cubic capacity of 850c.c. and a power output of 34 b.h.p. at 5,500 r.p.m. The engine is mounted transversely in front of the car with the gearbox and final drive to the front wheels below it, making an extremely compact power pack that gives more room for the driver and passengers. The floor is practically flat, and the body is built out to the full length and width with a wheel at each corner. The B.M.C. small car is obviously destined to meet with world-wide success, and the corporation have long since laid their plans to meet the expected demand. The initial production target is 3,000 vehicles a week, divided equally between the Longbridge and Cowley plants, but this figure could well be exceeded. The Fisher and Ludlow plant is already geared to produce 4,000 bodies a week. In the important European market ,where there is considerable scope for improvement in British exports, the Austin Seven and Morris Mini-Minor should have nothing to fear because they are superior to the three best-selling cars in France, Germany, and Italy in their average figures for fuel economy, top-gear hill-climbing ability, and acceleration when making the best use of the gears. They offer the same seat width (but more leg room), yet are smaller and lighter – 10 of them can be parked in the space occupied by eight of the most popular Continental cars. Preliminary plans have been made for the cars to be constructed by the Innocenti firm in Milan. Some 2,000 of the new cars have already been sent abroad and they will be displayed today in motor showrooms in nearly 100 countries. 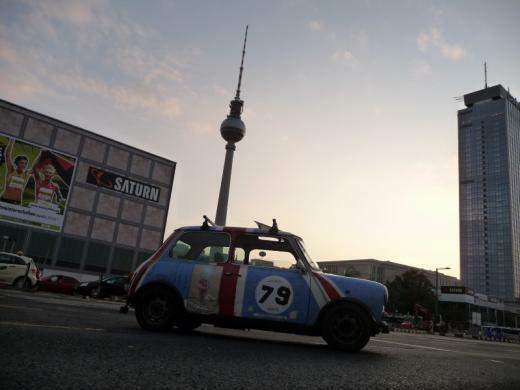 HAPPY BIRTHDAY MINI AND THANKS FOR 50 YEARS OF FUN ! I sometimes wonder if we’ll ever see revolution like this again. Yes, we’re enduring tough times, and the motor industry is beginning to do a great deal to try and counter the changing tide of public and political opinion. My happiest memory? I have many. But I remember the first Mini I biought back in 1992. It was a mid-blue 1977 Mini 1000. I’d fitted a Cooper grille to it and a 1300cc A-Series engine (from an Allegro that had been scrapped, okay?) and used to fly everywhere in it at warp speed. We rolled up at work, and all my work mates, who I’d tipped off beforehand, came out to watch him get out. And the bugger just jumped out as effortlessly as you like. 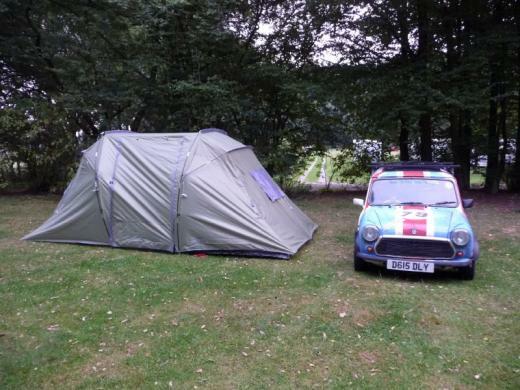 It seems Issigonis’ genius at creating the true tardis had been underestimated, even by me… a happy Mini owner. Another snapshot… day four of Staples2Naples. We’re following big Dave Smart in his Union Flag bedecked Mini through tiny little villages in Southern Italy. The crowds love him (or is it the car?) and wave and smile as we motor through their space. And on the country roads… we couldn’t keep up in our Rover 820. Not a chance. 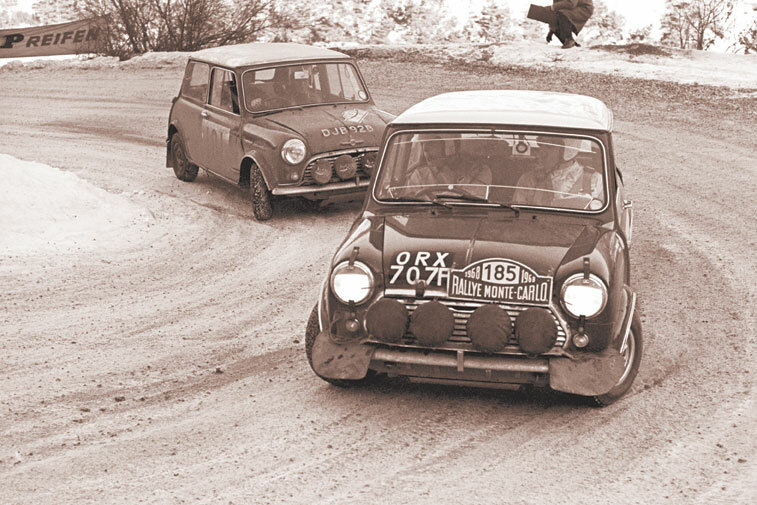 Minis: you gotta love ’em! Watching a 6′ 11″ teacher winding himself in and out of his. A Works Director borrowing his wife’s and managing to get two wheels off the ground as he turned into the company entrance at full pelt. The rusty rear subframe on my Wolseley Hornet collapsing while approaching a roundabout causing catastrophic fracture/loss of brake, fuel and Hydrolastic suspension pipes. 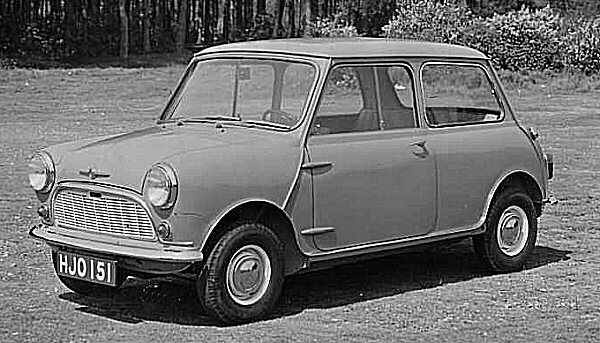 I travel in several Minis with my family in the past… an Innocenti Mini Minor Mk3, apple green, MIM1 plate was the first and the last was a Mini Clubman Estate 1100, yellow with green glasses, a pair of Lucas Square 8 recessed in the n ose and a wooden steering wheel. A friend tuned the engine with a revised carb and a wilder cam… I was seventeen at the time and I remember dad driving the Clubman nearly 100 mph overtaking a BMW 518 on the freeway. He usually drive a SD1 2600 at the time (great car) but his smile while was beating the bavarian icon I will never forget. I had two a 79 Brown Clubman Estate and a 77 Blue 1275 GT both huge fun and put a smile on my face every time I drove them. I’m 6’3″ and have never had a problem getting in one and my Dad was 6’6″ and he had about four of them when I was a kid and also never had a problem. Mini’s really are like diving a go kart on the road and I can’t think of anything modern car that comes close to the same driving sensation, maybe the first Ford Ka but that’s all I can think of because what was a small car isn’t any more, everything feels a bit fat now….. I was at Tatton park show last weekend by Manchester airport(great show by the way £6 quid to get in – bargain)and there was a great mk 1 Mini that looked standard but had a supercharged A series engine and all round disc brakes I bet thats a great fun! Never a prettier or more fun car has ever been made! Onto my third and have never looked back (like the above comment – I’m fairly tall 5’11” – and my Dad had two minis and he was 6’2″). One of my favorite memories is going from Truro to Newquay in Cornwall in a friends Mini with 8 of us in it – an experience never repeated! Great car! Until recently I and then my girlfriend had a Russet Brown Mini thou’, complete with a few obligatory under-the-skin modifications. I used to pick up a friend on my way to work in it and we’d always have a great laugh blasting down the dual carrige ways and country lanes to work, especially seeing as we’re both over 6’3″ and twenty stone! After a speeding motorbike ended it’s life my girlfriend has bought a Rover Metro GTa which although a better car all round (more comfortable, larger, faster, more stable at speed), when it comes to pure thrills, be it flying down a country lane without ever needing the brakes or taking a shortcut across an industrial estate (or field, or footpath) at way less than the legal limit, nothing else I’ve driven comes even close. Minis have been a part of my life for as far back as I can remember and at 42 years of age that is a long time. I could waffle on for hours about how amazing and revolutionary the Mini was and how inspiring it was on the worlds car manufacturers, not to mention it’s incredibly successful and yet completely unexpected motorsport career plus that 1969 classic film which also starred Michael Caine and many other stars who got completely upstaged by Alec Issigonis and John Coopers finest. But I passed my driving test in my first Mini back in the Summer of 1985, which was a lovely 1975 BL Tahiti Blue coloured MK3 Mini 1000 and although I did try to move on to more modern, more comfortable and much faster cars some time afterwards, I soon realised that life just wasn’t quite as much fun without a Mini. So I’ve been a hopeless Mini addict ever since who is resigned to having a Mini as part of the family until cars are banned or petrol becomes extinct. Then I’ll probably keep it in the garage as a well loved ornament, as well as another family pet. Apart from anything else, a Mini is just so much fun to drive and better still it’s still so much fun to drive at legal speeds (which is great news on today’s ‘Gatso’ camera inflicted roads, so you can have fun and not lose your driving licence). All you need is a few bends and the odd roundabout so you can savour that legendary road-holding and handling and before you know it you’re grinning from ear to ear like a Cheshire cat. Anyway happy birthday you little bleeder.